Today's post features the third of a set of cards I created for next week's Card's, Etc. Workshop and it's probably my favorite. (Details about the first two cards were in yesterday's post.) I wasn't sure how the color combo would work, but I think it turned out really pretty. 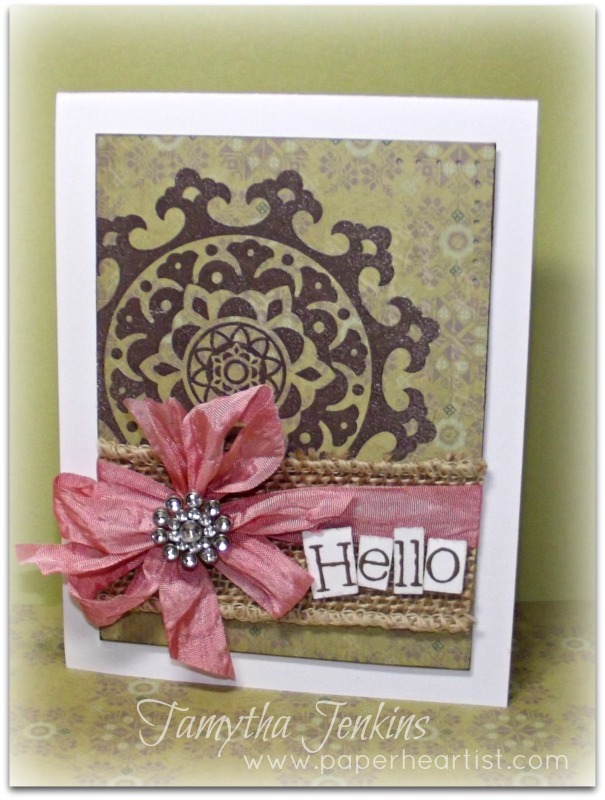 I used a little inspiration from both ColourQ and CASE Study for help with this card. I used CASE Study #122 and ColourQ Challenge #170. The ColourQ challenge is interesting this week, as each member of the "Royal Court" selected a different palette, giving participants 13 different color combos to pick from! Pretty cool. I selected the palette that Silke used. Tamytha this is gorgeous and love the vintage/shabby chic feel to it. Such a pretty card. Love that bow! Thanks for joining us at the ColourQ this week. Tamytha, did you use the ink pad with a dauber on the ribbon and then scrunch it up? I just love the effect! 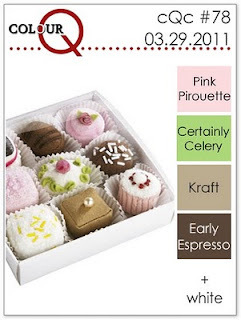 I would have never in a million years thought to accent that paper with pink! LOVE it. 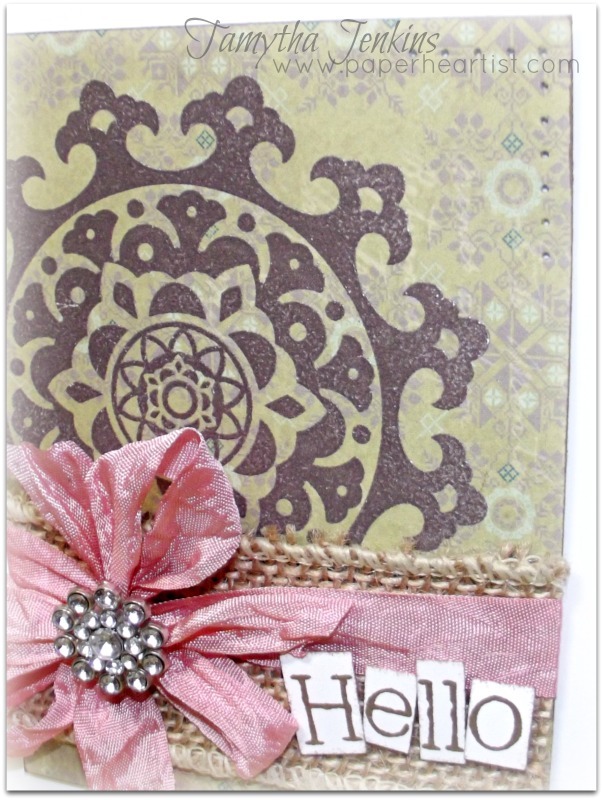 As for the ribbon, I used baby pink ink pad directly on and all over the ribbon. I then used Blush ink directly on the ribbon, but just in spots/streaks. I then scrunched the ribbon and put it into a ziplock bag. Before closing the ziplock bag, I spritzed the ribbon with water and then crunched and squished away. The trick is to not use to much water, as to wash away the ink, but just enough to help wrinkle it and to help mottle the ink a little. After a couple of minutes, I allowed it to dry and even hit it with the heat tool a little to speed it up. 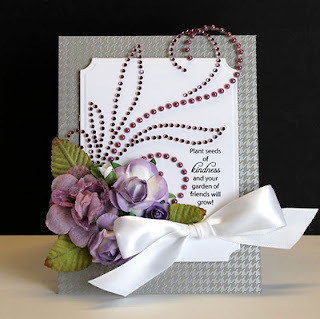 Beautiful card, Tamytha, lovely design as well! Thanks for joining us at the colourQ this week. fantastic ribbon and gem, tamytha - lovely!